We knew this was in our future, it's time to replace the Sails on Eximius. Our choice was to go local, not the cheapest but there's a lot to be said for giving business to local companies. 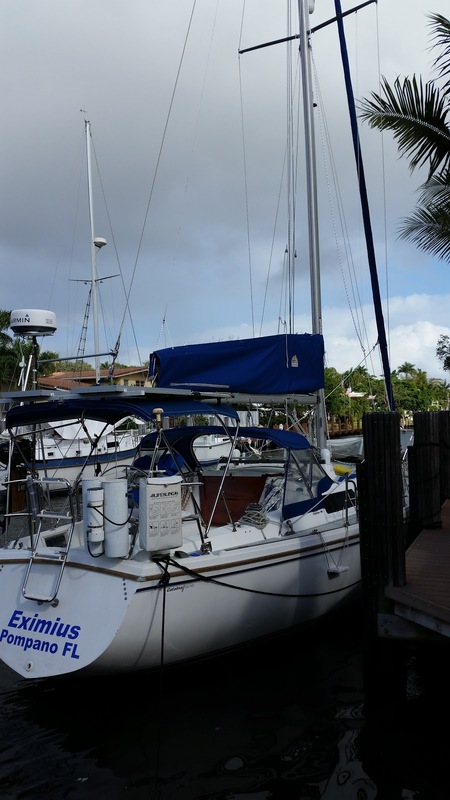 We chose Super Sailmakers in Fort Lauderdale. Their sail loft is only 20 minutes away from the slip where we keep Eximius and the rep lives even closer. One choice we made was to go with a loose footed mainsail. Instead of the foot of the sail being attached to the length of the boom and at each end, a loose footed sail is only attached to the boom at the front of the sail (the Tack) and the back of the sail (the Clew), this allows the sail to take a natural shape along it's foot. 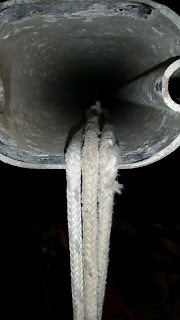 But the Clew is secured to the boom by the Out Haul, and that piece of rigging is 27 years old! Might need to replace it. 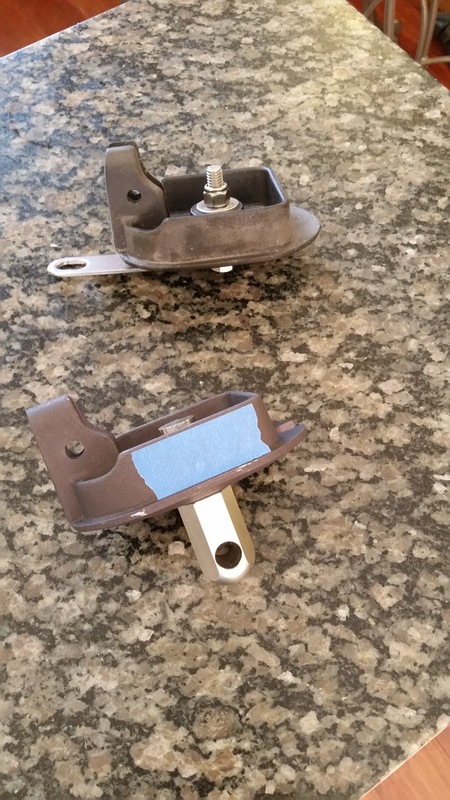 Nice new castings and no cracks in the steel. This is the old front end fitting. Yuk! It was a challenge to get the end caps off. I drilled out the screw heads but could not drill out the screw shaft. In the end, I just punched them through with a nail punch. 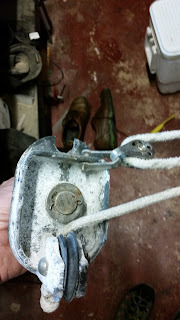 They were self tapping screws into pre-drilled casting holes. 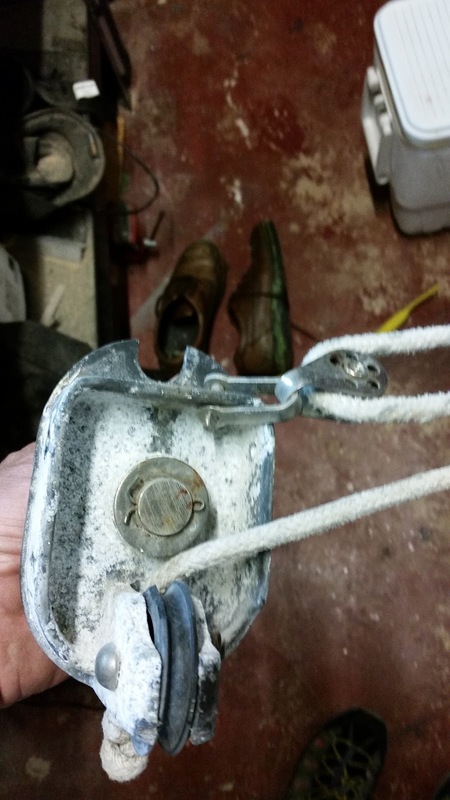 There's a lot of surface corrosion, the sheave has a couple of broken edges and the split pin holding the gooseneck fitting is a renown failure point. Of course the tackle looks pretty shot too. 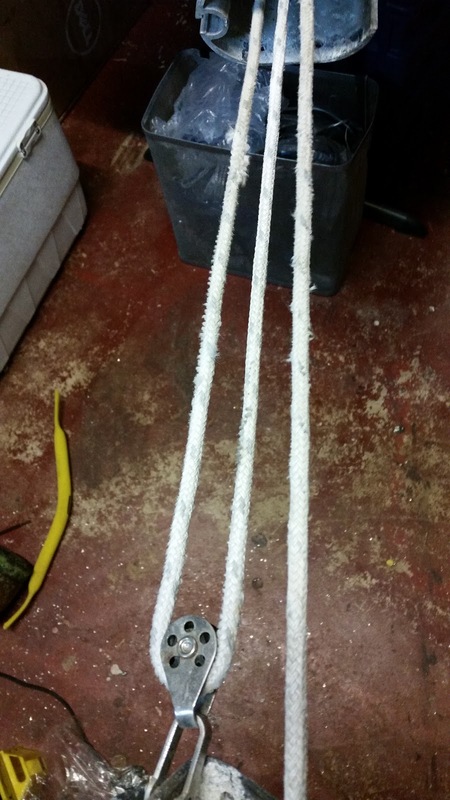 This is the aft end boom fitting, a bit of corrosion, it's missing the topping lift tang and the sheave has a few broken edges. You can see the out haul wire, it's in pretty good shape, but I hope never to have to open the boom again, so I'll change it out now. This shows the tackle that is inside the boom, it's a 3 to 1 purchase and the line is pretty much past it's best by date. The blocks are ok, so I don't have to replace them. 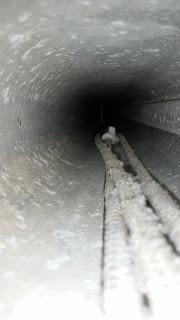 The inside of the boom has typical surface corrosion, but the end where the caps fit (this is looking from the front of the boom) inside need a clean up, a hard scrub should suffice. Notice the lines have suffered over the past 27 years. Looking deep inside the boom, nothing other than surface corrosion showing that might bee snagging the lines, so I'm assuming the line damage is just ages of abrasion against the edges of the boom. Thinking about putting a pvc tube inside the boom, nice clean smooth surface, that should eliminate the abrasion. Had a really good day working on the boat! 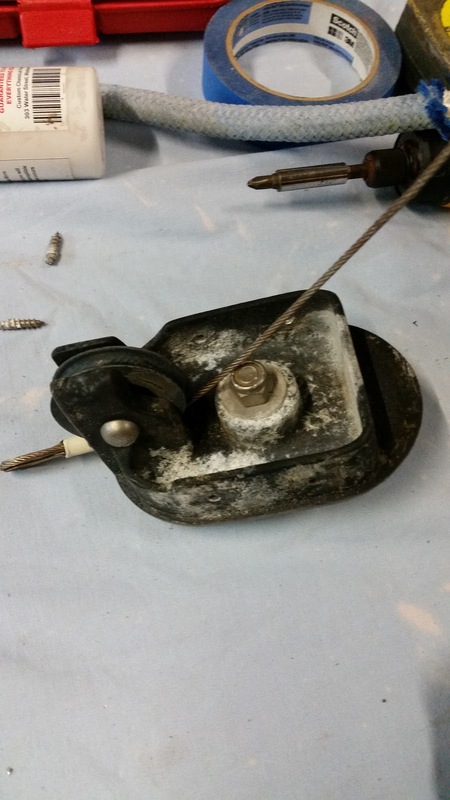 Completed the replacement of the outhaul and the Gooseneck Casting Assembly and aft boom casting. Replaced the Topping lift control line and the Main Halyard that's the white line with blue flecs. The line is a bit long right now, but I'll wait till the new sail is installed on Tuesday before I cut it shorter. 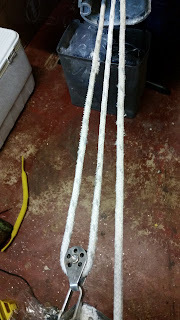 Have to find out something to do with the 100' of the old halyard line. With the new lines in place, I put the Cradle cover back on the boom, the support lines are temporary (the old lazy jack lines) and the cradle is empty right now, waiting for the new sail to be installed on Tuesday.It's starting to come together. Modifying the Bimini beneath the solar panels to eliminate the puddle that forms every time it rains. Re-working the jib furler system so that it's easier to roll in and let out the jib as the wind dictates. 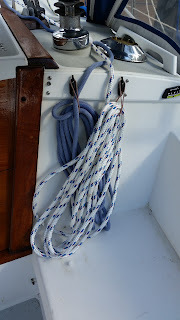 So today was a really good day, crossed off several items that were bugging me and got the boat ready for the new sail install Tuesday, assuming the weather co-operates. Talking about weather - do I really need a wind turbine? Hmmmmm.